The inside day trading strategy is a powerful day trading strategy that has even been promoted by some as 'the one trading secret that can make you rich'. The strategy is primarily based around stock trading, but could just as easily be adapted to more leveraged financial instruments including futures and if your broker has them, Contracts for Difference (CFDs). CFDs are not available from US brokers but brokers in other countries such as Australia and the UK allow CFD trading on US shares. It is primarily a 'scalping' strategy, designed to take advantage of short term price consolidation followed by a subsequent breakout in either direction. Once the breakout occurs, you enter at a predetermined price point, take profits and exit shortly after. Do this enough times a day by locating enough stock trading opportunities while the market is closed - and providing you have sufficient capital (or leverage) to make the necessary trades, you can easily bring in about $400 per day - almost on autopilot. To begin with, inside day trading involves identifying what an "inside day" actually is. Once we've done that, we then need to apply a simple but strictly observed set of rules for entrance criteria, stops, trade management and finally, exit rules. Historically speaking, inside day trading using the correct set of rules has a 90 percent success rate. For the remaining 10 percent, you simply set your stops at predetermined levels and take small losses. The maximum stop loss must never be greater than the range of the inside day that indicates the setup. An "inside day" always reveals itself by the appearance of a specific bar on a daily chart the day after a preceding bar. It will generally be a day with a narrow trading range and the critical factor is that it has a 'lower high' and 'higher low' than the previous day. 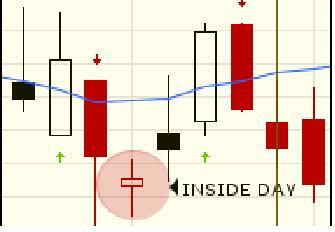 To qualify for inside day trading, the range of this bar must be not more than 50 percent that of the preceding bar. It is important that inside day trading should only be considered for highly liquid stocks. You need to be able to have your orders easily filled without slippage. Once you have identified an inside day trading opportunity, you then draw a 'channel' across the peak and trough of the inside day. You then set your entry points at one cent above and below of the channel. You should use a 'one cancels another' (OCO) type order for this, so that whichever way the stock breaches the channel, one trade will be entered and the other cancelled. If the stock breaks above the channel, you 'go long' the stock; if it breaks below, you 'go short' the stock or derivative as the case may be. You then set your stops at one cent above or below the opposite end of the channel that your order was filled on. 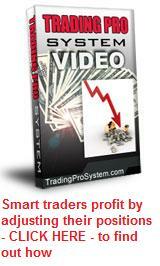 After this, it is simply a matter of managing your trades by calculating and setting profit targets. The simplest and most conservative profit target is the range of the inside day added to the trade entry price. There are however, more advanced exit strategies which are slightly more involved. This inside days strategy is a powerful short term trading tool. Trade setups are easy to identify and entry points can be preset before the market opens, so you can have quite a number running at one time. With preset stop losses and profit taking points, you can then just let the market "do its thing" and reap the rewards. If you would like to know more about trading inside days, there is a video and .pdf document explaining the system in more detail, included among the bonus files that come with the very popular Trading Pro System.